SANTA ROSA, CALIF – MindShift Gear’s First Light backpack series addresses the most pressing needs of outdoor photographers who travel and trek, especially those who carry their 200mm to 600mm “Big Glass” lenses. These high capacity backpacks come in three sizes and feature contoured, adjustable torso harnesses with 11 adjustment points for extreme comfort whether running through an airport or traversing a mountain. Designed to comply with airline carryon size requirements, First Light backpacks are built with ballistic nylon bottoms for durability, room for a laptop and personal gear, and in the two larger sizes, a dedicated pocket for hydration reservoirs. Exterior: For superior water resistance, all exterior fabric has a durable water-repellant coating; the underside of the fabric has a polyurethane coating. It also has the highest quality abrasion-resistant YKK RC-Fuse zippers, 420D velocity nylon, 420D high-density nylon, 1680D ballistic nylon, 210D nylon, 320G DuraStretch mesh, nylon webbing, 350G airmesh, nylon webbing, 3-ply bonded nylon thread. 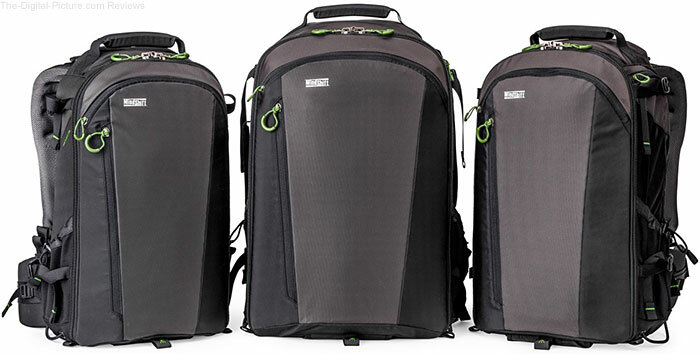 MindShift Gear has the FirstLight 20L, FirstLight 30L and FirstLight 40L in stock and ready for delivery.